Product packaging has borne some serious brunt as of late, with bottled water being lambasted left and right as a a needless contributor to landfills. Taking this into account, everyone’s favorite celebrity designer Yves Béhar created these vibrant Y Water bottles with a life-cycle that extends beyond their initial use. The bottles are completely recyclable, don’t leech chemicals, and once empty, each little bottles becomes a building block that combines to create expansive geodesic shapes. 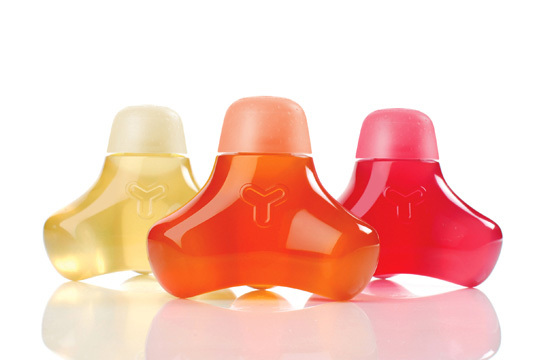 These alchemical combinations of lucent plastic propose an innovative solution to the bottle’s lifecycle, extending it through play. Plus, they taste pretty good too. Row your boat over to Inhabitots for the full story. I like your site! We're looking into an idea and this site has some great products, thoughts and ideas......thanks!